This discussion and analysis section for Illustrative Feature 06 provides interpretations of observations made at the IF-06 location. The main field observations section, Illustrative Feature 06, contains supporting information used to justify the interpretations presented in this section. The interpretations presented here are guided by a recently revised model (April, 2017) reflecting the newer IF-06 field observations along with a reanalysis of previous observations described in the earlier sections of the Heart of Avalonia Frost-heaved Bedrock project. The new model, the subglacial ice segregation/cold deglaciation model, deemphasizes the role of pressurized liquid water flowing in joints and instead emphasizes migration of pore water through bedrock as the principal mode of water transport toward sites of subglacial bedrock disruption. In this model, joints serve primarily as collectors of pore water and sites of initiation of ice segregation. Several assumptions are set out below in an effort to link all of the field observations to date into a coherent description. These assumptions appear reasonable based on the evidence collected thus far, but still do not provide a complete picture. Most significantly, the forces driving water through bedrock, potentially over long distances, and the conditions of permeability and porosity of frozen foliated bedrock are not yet incorporated into the model. The model also places constraints on the climate during deglaciation. These constraints are interesting but unproven. Observations and interpretations from the illustrative features, IF-01 through IF-05, were aimed at determining whether frost-heaved bedrock occurrences seen in a specific area on the Isthmus of Avalon were formed under subaerial conditions or subglacial conditions. The conclusion reached for these local occurrences was that they were of subglacial origin. It was further determined that there was a close relationship between certain observations of plucking and bedrock frost heave. The two processes appeared to differ only in the slope of the ground on which they occurred. The area where features IF-01 through IF-05 were found appeared to be characterized by spatially uniform glacial ice flow during the time of formation of the features. This observation helped in attributing a subglacial origin to the features. The location for IF-06 was selected when observations at another area on the Isthmus indicated that late-stage ice flow was either subdued, irregular or both. This apparent lack of significant, uniform ice flow enabled an attempt to isolate the role of stress from non-glacial sources in disrupting subglacial bedrock. To interpret the observations from IF-06, it was critical to establish a subglacial or subaerial origin for the observed bedrock disruption features. A subglacial origin was suggested by the proximity of the IF-06 location to the locations of IF-01 through IF-05. Other direct evidence supporting a subglacial bedrock disruption environment was found at the IF-06 site. It should be noted that glacial ice can play at least three different roles in mediating bedrock disruption occurrences. First, glacial ice can shift rock horizontally across open, level ground. Second, glacial ice can moderate rock motion, setting up precarious assemblies of broken bedrock. Third, glacial ice can confine ice and water at high pressure at a site of bedrock disruption. Each of these roles was evident at the IF-06 site. 1) The shifts of the large frost-heaved joint blocks (A) (see IF-06 description) on the top of the ridge, IF-06, were improbable given a subaerial frost-heave event. In particular, the large dislodged block (block 1 in IF-06 description) was shifted horizontally from its point of origin in a manner suggesting ice moving tangential to the ground. 2) The formation of the highly cantilevered rotated-slab feature (B) indicated the concurrent presence of glacial ice. The feature is delicately balanced and precarious and seemingly unable to survive a subaerial collapse from the cliff face. 3) The abundant drainage around frost-heave/frost-wedge features (C) and (D) makes retention of ice or water under sufficient pressure to shift rock unlikely unless under glacial ice. Indicated assumption: The bedrock disruption features comprising IF-06 are of subglacial origin. Some of the displaced bedrock comprising IF-06 occurs in a configuration where it could be explained by plucking by a temperate glacier. In the conventional description of plucking under temperate ice, ice melts under pressure as ice bears on an obstruction. Water is transferred through bedrock channels (pores, joints) and re-emerges at a location of reduced pressure. The water refreezes and imparts tensile stress to bedrock at the site of re-emergence. This process can be termed the regelation process. The regelation process cannot account for bedrock disruption at a site where there is no reduced-pressure environment. The process cannot therefore account for simultaneous rock displacement on two opposing sides of an obstruction. The regelation process is also an unlikely cause of bedrock frost heave on a horizontal surface where rock displacement is directly upward. The regelation process seems particularly inappropriate to describe bedrock frost heave occurring vertically on top of a protruding body of rock which is surrounded on all sides by downward slopes. IF-06 is a cuboidal ridge bounded by downward sloping rock on all four sides. An exception to the analysis in the preceding paragraph might be found in a situation where a distant elevated ice mass drives pressurized water deep underground. Such an ice-generated artesian aquifer could then resurface at a site of lower elevation and theoretically refreeze in a reduced pressure environment. This type of action would be unlikely on the ridge, IF-06. The ridge is narrow (6.2 m across at site of feature (A)(see IF-06 description)), with steep sides. To form the frost-heave features (A), the rock comprising the ridge would need to serve as a "pipe", bringing pressurized water from depth to the top surface without excessive leakage and without causing excessive bedrock disruption or complete disintegration of the sides of the ridge. Most of the disrupted bedrock features seen on the ridge IF-06 seem unlikely candidates to survive origin by regelation beneath a temperate glacier. Ice segregation can account for a diverse range of disrupted bedrock occurrences. When water remains mobile by molecular effects in narrow channels (Gibbs-Thomson effect or analogous effects), the water need not be transferred under high pressure and a large pressure drop is not necessary to initiate crystallization when water escapes pore-space confinement. The most versatile bedrock disruption mechanism conceivable is subglacial ice segregation. Given that water molecules can travel through cold bedrock and crystallize onto ice masses in joints, fissures, cavities or onto glacial ice overlying bedrock, there are few limits to the configuration of the resulting bedrock disruption. Ice segregation is a process demonstrating positive internal feedback in that, once crystallization begins anywhere, the resultant segregated mass accumulates further pore water and expands. Systems incorporating positive feedback are unstable, a description well suited to explaining severe but irregular occurrences of bedrock disruption. Indicated assumption: The bedrock disruption features seen on the ridge, IF-06, owe their existence, at least in part, to the process of subglacial ice segregation. The process of subglacial ice segregation requires a thermal gradient from which mechanical energy can be extracted. This requirement eliminates the possibility of ice segregation occurring beneath a temperate glacier. Indicated assumption: The glacier overlying the ridge, IF-06, was cold-based when the observed ice-disrupted bedrock features were formed. A question now arises: How much rock motion can be attributed to the direct effect of ice segregation and how much motion is attributable to glacial ice creep? In the case of block 1 in frost-heaved bedrock feature (A), the motion of the block vertically upward at the beginning of the frost-heave process would be attributable solely to ice segregation occurring beneath the block. As the block was forced upward into overlying glacial ice, it began to tip in the direction of horizontal ice creep. Its motion at this time was governed by a hybrid ice velocity vector, combining non-tangential ice motion (accumulating segregated ice) and tangential ice motion (glacier creep). The block was eventually tipped over by tangential ice creep occurring 10's of cm above the ground and, following being dislodged completely from bedrock, was carried a few 10's of cm down ice. Complete deglaciation ensued without the block moving further. The large rotated slab feature (B) likely involved only a minor contribution of ice volume from an ice segregation process operating behind the slabs. Nevertheless, it is probable that frost wedging via subglacial ice segregation started the process of widening joints behind the slabs. The delamination of the slabs and of other nearby similarly oriented sections of rock suggests that a frost wedging process was active in this geometry. A large volume of ice was needed to fill the space behind the slabs as they rotated outward from the cliff face. This volume likely came from glacial ice creep. The reasoning for this assumption is that the slabs rotated away from the cliff rather than shifting directly away from the cliff without rotation. Low rates of transfer of pore water through bedrock would make it difficult for segregated ice volumes to compete with glacial creep volumes, given the arrangement of the rotated slab feature. The very large frost-wedged block feature (C) was likely shifted entirely as a result of segregated ice filling fissures south, east and possibly, underneath the block. While glacial ice did not move the block, it remains probable that glacial ice pressure mediated the occurrence of this feature. A lowering of ice pressure in the lee of ridge, IF-06, would encourage development of segregated ice in appropriately aligned joints. The lee side of the ridge was defined by indications of ice creep northward and westward, making northwest sloping surfaces on the ridge, lee surfaces. Note that in addition to feature (C) two other very large sections of rock separated from the ridge via fissures, the rock thereby shifting in a northwesterly direction. These other features are identified in the IF-06 description. The eastward-directed frost-heaved block (D) and other "reverse" shifted features are unlikely to include any glacial ice creep component in the ice velocity vector responsible for guiding their motion. For these features, pressure from accumulating segregated ice beneath the features overwhelmed the relatively small differences in glacial ice pressure surrounding the ridge. There are examples of rock shifts in all 5 possible surface orientations on the cuboidal ridge, IF-06 (the sixth direction, straight down, is an excluded possibility). Very low creep velocity in glacial ice overriding ridge IF-06 would tend to keep pressures on the variously oriented surfaces from differing by large amounts. An important aspect of the present model for explaining diverse disrupted bedrock features on the Isthmus of Avalon relates to generation of the over pressure in bedrock pores needed to drives pore water toward the surface. The volume of frost-heaved bedrock feature (A) (0.4 cu. m)(see IF-06 description) requires an equivalent volume of pore water to displace it from bedrock. Given realistic estimates for bedrock porosity, it is clear that pore water must travel a substantial distance to reach the frost-heave site in sufficient quantity. It should be noted that complete desiccation of bedrock pores is unlikely in a subglacial frost heave process and that most pore water originally present in the rock likely remains in the rock. A continuous long-term source of over pressure in subglacial bedrock could be provided during a cold deglaciation event. A bedrock aquifer underlying a deep glacier would initially be under pressure (~1 MPa per 100 m ice thickness). In a temperate deglaciation event, the release of this pressure as overlying ice thins would add to basal water already present. In a cold deglaciation event it is assumed that the temperature at the base of a thinning glacier remains constantly below the pressure melting point. Pore water originally present under equilibrium pressure with thick overlying ice becomes over-pressure pore water as ice thins. Pressurized pore water migrating toward the cold glacier base becomes available to supply water to an ice segregation process operating in bedrock near the glacier base. Depending on bedrock porosity, permeability and deglaciation thickness changes, the volumes of water available are substantial. A model based on bedrock pore water being pressurized by distant higher-elevation glacial ice cannot be excluded. However, this model also requires cold deglaciation at the site of bedrock frost heave, if ice segregation is assumed to underlie the frost heave. Indicated assumption: The site of IF-06 underwent cold deglaciation as the final stage of deglaciation preceding the Holocene. Cold deglaciation can proceed under a range of different climate conditions. The only necessity is that during the process, the climatic conditions leading to deglaciation must not simultaneously lead to warming of basal ice. In a rapid deglaciation event, a cold-based glacier would experience sudden surface melting and runoff. The melting would occur rapidly enough that basal ice under part or all of the melting glacier would have insufficient time to warm to zero degrees C before the ice thickness became trivial. This type of deglaciation event could result from abrupt climate change (sudden warming) such as appears to have occurred at the end of the Younger Dryas cold period. In a slow deglaciation event, the precipitation patterns that led to glaciation would change to a dryer pattern under which the balance between precipitation and surface runoff or evaporation would swing to favor ice loss. If weather patterns over the Avalon Peninsula changed during the Younger Dryas to favor a prevailing flow of cold, dry polar air over the region, then deglaciation could proceed in spite of low average temperatures. The high annual precipitation currently experienced on the Avalon is driven significantly by a steady stream of moisture-rich low pressure systems moving up the eastern seaboard of North America. The severe deviation in North Atlantic weather patterns accompanying the Younger Dryas could have allowed a persistent blocking high pressure system to divert moisture away from the Avalon, reducing average precipitation over an extended period. 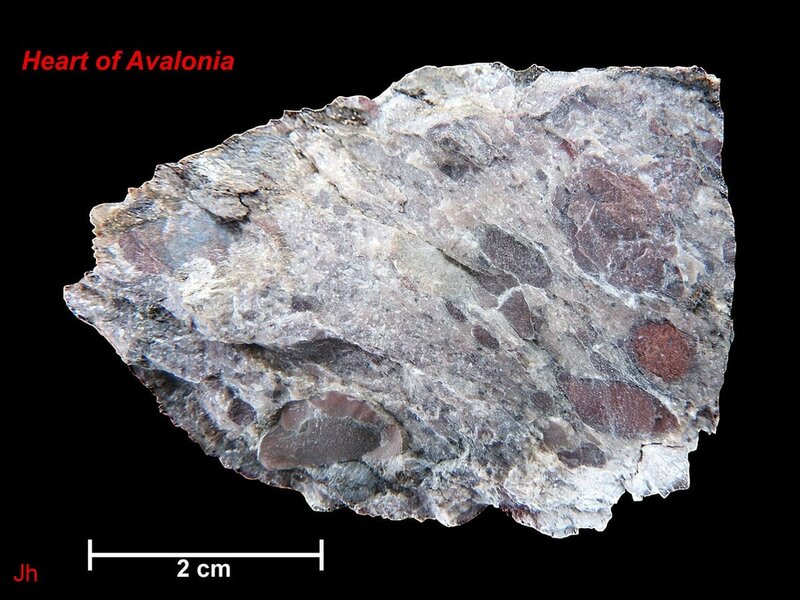 It is possible that both climate processes described above might have contributed to the cold deglaciation of the Avalon. The requirement that pore water travel potentially long distances to reach sites of subglacial bedrock disruption argues for a slow deglaciation process. Furthermore the additional requirement that heat be removed from sites of segregated ice buildup (Technical Note 10) argues for slow (timescale of decades or centuries) action in developing subglacial frost heave features. Advection processes could accelerate heat removal. 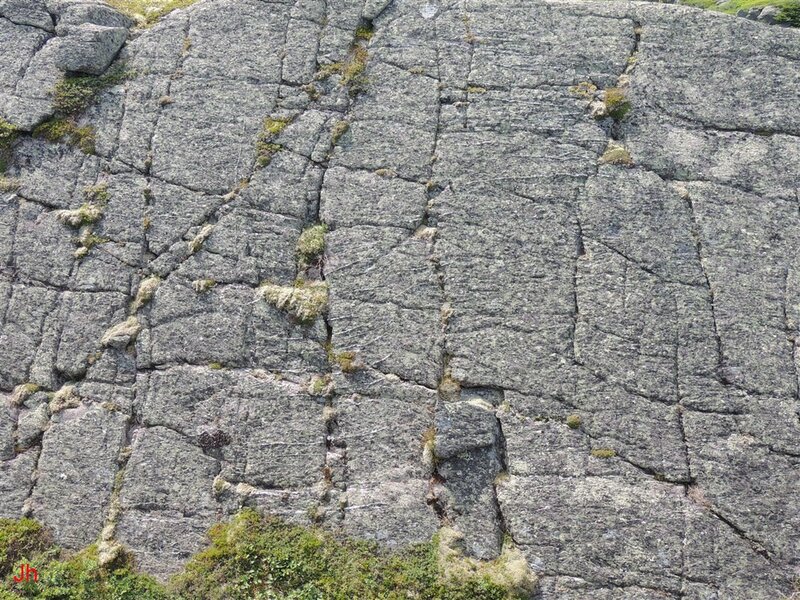 In the above photo (field of view is about 4 m across) notice the narrow horizontally-trending quartz veins intruding the rock. These veins are running orthogonal to the longitudinal foliation, suggesting that the hydrothermal activity yielding the veins preceded tectonic compression of the rock. The presence of the quartz veins might indicate hydration of the volcanic minerals originally present, producing phyllosilicate minerals which eventually contributed to the development of strong foliation during regional metamorphism. The horizontal trend in the orientations of the quartz veins suggests pretectonic horizontal layering. The rock at this location could be eutaxitic ignimbrite. Outcrops of positively identified eutaxitic ignimbrite are found within 5 km of the IF-06 location. The above photo shows a small (approx. 30 cm high) glacially deposited boulder at the IF-06 site. 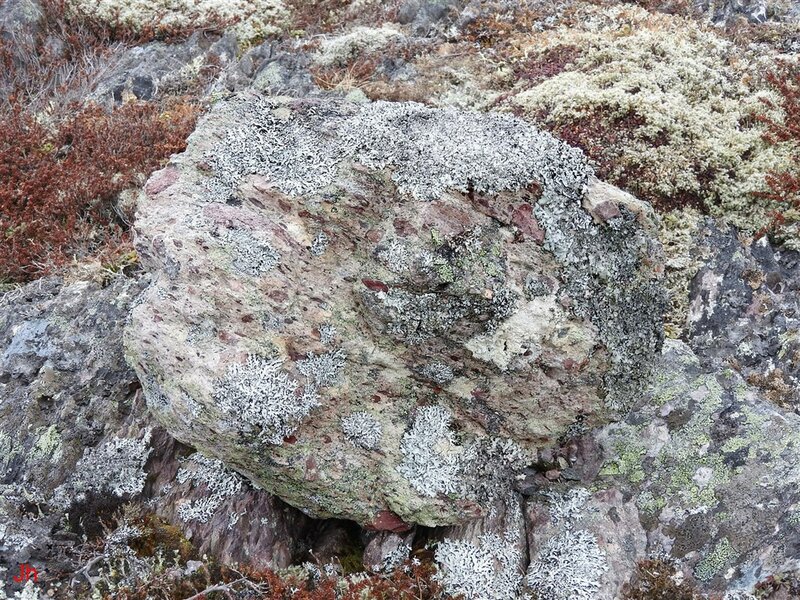 The bleached surface of the rock is likely a rind, with the more typical color being seen in bedrock at the base of the boulder. Much of the ignimbrite in the area contains clasts of millimeter to multi-centimeter dimensions. The ignimbrite specimen from IF-06 shown above was scrubbed clean of lichen. The sample was then measured to determine its specific gravity. The specific gravity, determined on a precision laboratory scale using 4 deg. C water was found to be 1.94. 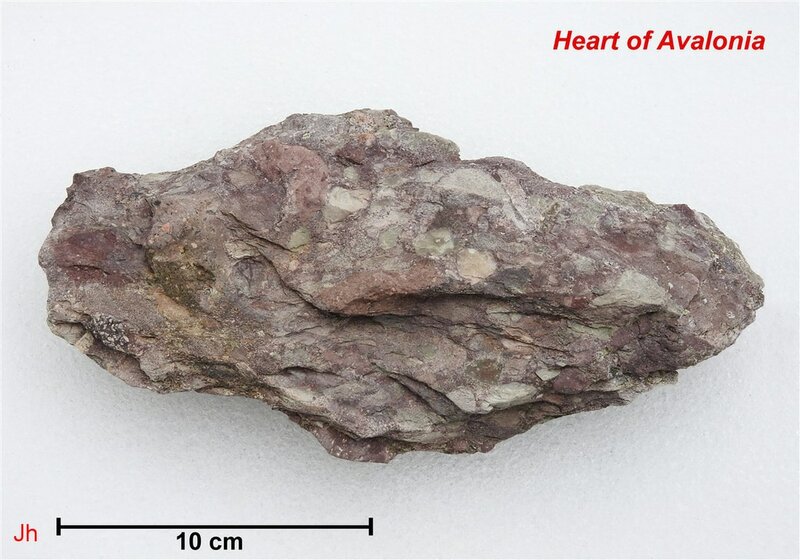 This value is much lower than is characteristic for this type of rock (density is typically ~2.65), suggesting that the specimen has a high porosity. An estimate of the porosity was made by assuming the rock was saturated with water when found (loose specimen was picked from a shaded wet location in winter, kept wet and tested immediately). The weight loss measured after heating the sample to 150 deg. C for six hours indicated a porosity of 1.1%. This value was lower than expected based on the low density of the specimen, indicating that the specimen was either not fully saturated with water when tested or else was insufficiently permeable to water vapor to allow all water to escape when heated. The low density of this specimen could be the result of weathering. A second smaller specimen from IF-06 was chipped from bedrock with a hammer. The surface shown above is unweathered. The specimen weighed 432.3 g when collected and the weight was reduced to 430.3 g after heating to 150 deg. C for 6 hours. The specific gravity of this specimen was 2.54 and its porosity based on moisture loss after heating was 0.5%. The bluish sheen seen on a clast near the upper left of the specimen is an iridescence and suggests oriented platey crystals as would be expected in a metamorphosed phyllosilicate mineral. The oval-shaped reddish clast seen at the lower right of the specimen could be a fiamme. This supports the argument (see above) that the IF-06 bedrock is eutaxitic ignimbrite. Much more work is needed to better characterize the bedrock at the IF-06 site and other Isthmus of Avalon frost-heave sites in regard to determining susceptibility to groundwater penetration under freezing conditions. The ice-disrupted bedrock features seen at the site, IF-06, can all be explained within the context of a subglacial ice segregation/cold deglaciation model. This model is particularly useful in explaining a frost-heaved bedrock occurrence on top of a narrow ridge, and in explaining frost-wedged rock being pushed outward from surfaces sloping in multiple different compass directions. Other models can be envisioned, incorporating several stages of bedrock disruption, occurring under different conditions and with each new stage leaving features intact from the previous stages. However, the subglacial ice segregation/cold deglaciation model appears to be the simplest model.